Design antibiotics. Investigate viruses. Improve our food. UToledo’s biochemistry majors are problem solvers. They try to solve biological problems by studying chemical systems derived from living organisms. Biochemistry combines biology and chemistry to study living organisms at the cellular and molecular levels. Biochemists try to solve biological problems. It’s easy to see how biochemistry applies to medicine. A biochemist can investigate viruses and bacteria that cause human disease. They help develop treatments for cancer, heart disease, diabetes and Alzheimer’s disease. The University of Toledo offers both a BS and a BA in biochemistry. For students who want a broader curriculum that can include additional preparation in another science. BA students often double-major in biology or chemical engineering. Award-winning, research-active faculty. Our professors study everything from the smallest molecular structures to how chemistry impacts the environment. We encourage undergraduates to get involved in faculty research, and even offer part-time research positions in labs. Students often present their results at conferences and publish their work in scientific literature. Study abroad. UToledo has an exchange program with the University of Salford, England. More than 200 UT pre-medical, chemistry and science students have studied at Salford since 1984. 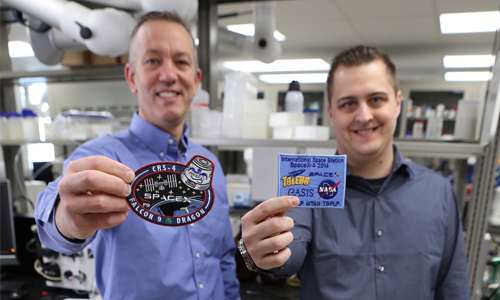 UT biochemist, with help from astronauts, studies new way to target dangerous stomach bacteria. Read more.